From Aztec, creator of Escape from Island and The Shrine, comes yet another superbly crafted point-and-click adventure game, Escape from Octlien. The sci-fi themed title drops you inside a spaceship with very little information on what you're supposed to do. Explore the environment, collect items, and try and make your way through this lengthy and challenging game. Controls in Escape from Octlien are as simple as any online adventure — just click the items you want to interact with. Arrows appear on the edges of the screen to navigate and you use items by dragging them onto the object you want to use them on. To examine and interact with items, slide one over to the "check" button. The puzzles are rarely easy to solve and usually include a number of steps before you see tangible results. For example, one item may give you access to a room where you'll find another item that fits in part of a puzzle located halfway across the ship. This doesn't feel frustrating or lead to mindless backtracking, it just adds to the intruigue. Your sense of accomplishment is broken into bite-sized pieces that keep your appetite for the game burning strong. As with Aztec's other releases, the visuals in Escape from Octlien are stark but well-implemented. Sound effects are all but non-existent but fit the game extraordinarily well. A mysterious atmosphere is successfully created using as few elements as possible. One of the best point-and-click adventure games released in the last few months from a developer that's quickly building a reputation for impressive games. 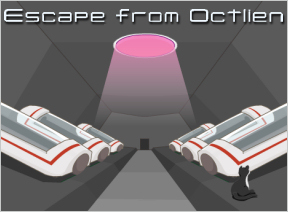 Escape from Octlien Walkthrough now available! You get dropped off in some kind of garbage heap. Grab the shovel, ladder, and behind the rock on the bottom right pile is a wheel type thingy. The white box and the paper type thing can be moved but there's no purpose (as far as I can tell) Grab onto the crane once you're done here. The crane pulls you up to the next level. On the right try and find a panel on the wall you can click, it will reveal a small pink "Octsaurus Plate." Pick it up as well as place the wheel thing you grabbed from below on the hole to the right of the crane you came up by. Rotate it once to open up the door and go through. On the left wall of this room you can click a panel to reveal a pink "Octpus Plate." Grab it and leave, that's it for this room. Notice the colored panels on each side of the door in front of you (it changes for each game so I can't help you there.) Go to the left first. You can enter the color code from the previous screen on the panel on the top left which will open the door. Before you go through though, click the panel on the right wall to get a weird pink thing. Drag and drop this onto the "Check" box in your inventory and click on the item once to reveal that it is a "Laser Sword." Cool. You can open a panel on the bottom left and open the panel with the sun symbol, but there's nothing there. Move through the door. In the next screen all you need to do is click on the plug by that huge thing. There's a panel to the top right you can click on but its useless, and you could move on but you can't do anything in there...yet. Head back to the door with the color codes and this time take a right. Now you're in the hallway to the right of the color coded door. You can plug in your other code at the top right panel, but this time click on the bottom right panel to reveal a key, and the panel with the sun symbol has a weird circle-thingy which you can grab. head through the door. Grab the lab coat and drag it to the "Check" box. Now click on the lab coat's left pocket to get a satellite controller. Press the green button to turn it on and the yellow button to call up the satellite. Click on the middle pod on the left side of this room to reveal a pink keycard. The cat is useless right now (you can try to attack it with your sword, but it has some alien kitty-cat shielding device.) Go through the door ahead. Robots are coming off of an assembly line here...cool. Take your laser sword and start hacking this place to bits...actually, just cut the pipes above you. It doesn't seem to do anything yet, but it has a purpose. Click on the red button on the right to reveal a door. Go through it. In this room you see the arms being put on the robots. The button on the top right doesn't do anything, but clicking on the blue button stops the assembly line. Before you hit the button, however, use your laser sword on the glass to make a hole. Now you need to grab one of the arms as it comes down before it is put on the robot. You can use the blue button to stop it to make it easier, but its just as quick and easy to grab the arm as it is coming down. Either way once you have your arm you can leave this room and never ever return. Head back to the color coded door and this time head straight through. In the next room are two doors, one above and one below. Just keep going straight through the one below into the next room. In this room use your shovel on the pile of gold on your left in this room to reveal a space suit. That's it. Go straight through this room for now. In this room is a giant robot. Sweet. Use your keycard on the weird box with the three red lights on top of it. Now head back two screens to where you saw the two doors. use you ladder here to access the top room (just so you know, to go straight through the bottom door use the arrow on the top of the screen, to go through the top one click that door). You have three options here, but before you do anything you should take notice of the little brown box that you've been seeing in a couple of different places. The one in this room is on your left before the door. Drag your "Octsaurus Plate" onto that box and it should click in. Other boxes around the ship are activated the same way with a certain plate. Go right for now. On the top right wall is a panel that you can open to get an "Octape Plate." Use your robot arm you got from the assembly line on the white button looking thing to the left of the door, and then use your key on the door. Go on through. You'll notice a green wheel on the left side of the right red thingy (near the walkway towards the big blue tank). Click this to fill the right area with water. Grab the red crystal that floats to the top. Now use your laser sword on the big blue tank in front of you to cut it open and send water down the drain (In case your wondering this sends water down into the assembly line where it falls through the cut pipe and into another grating into the garbage heap. We'll head there soon, but not yet). Leave this room and leave the next room to get back to your three way intersection. Take the left path. In the next room try and find a panel on the top right that you can click on to make it fall away to reveal a cord. The panel is hard to find and looks like a normal part of the wall, but its just above the door and a little futher down the hall. Once you have the cord take the button circle thingy you got a long time ago and use it on the hole on the left wall. Once in the hole press the button to open up the door. Go through the door. Use your cord on the right side of the big circle electrical thing to connect it. Then press the cylinders on the right side of the screen by the red orb to reveal your fourth and final plate: "Octlien Plate." Your "Octpus Plate" fits in the square holder by those cylinders as well. Leave this room and go back to your three way intersection. This time go straight. There's nothing to do in this room so go straight again and watch the cutscene. Big gun pointed at Earth...cool. There's nothing else to do here, although it seems like the pink card on the back wall can be clicked...it can't so don't bother. Head back three screens so you're at your ladder again. Place your "Octape Plate" on the left side of the ladder and then go through the bottom door. In the room with the pile of gold is the last brown box you need to worry about to the left of the door. Place your "Octlian Plate" there. Go through the door. the blue orb should be glowing blue now, which means the robot is powered up. Activate him by pressing each of the three red buttons above the keycard box sequentially and he'll blast off through the roof. He'll drop a pink tablet afterwards. Now you can go ahead and beat the game which will only get you 80% (or 70%?) completion. If you don't care about your completion rate then skip to step 26, otherwise read on. Head back to the color coded door and take a right and go straight through the next door. Now you can pick up the cat and he'll crawl into your spacesuit...creepy. Go back all the way to your garbage heap. The garbage heap should be filled with water by now. Floating on the top should be "Emerald Green Snack." Pick that up and then also click a couple of times on the left most hole at the top to reveal a golden flake. Pick that up as well. In the garbage heap you can see a hole on the top right you can go into. Go ahead in to see a statue before you. On the left and right walls are two panels that you can open. Both are somewhat in the middle and not too difficult to find. The golden flake goes in the left one and the emerald snack goes in the right. Watch the cutscene which kind of ties together this game with the previous (in my opinion). Almost done! Head back to the color coded door and this time head to the left and go straight twice to be at a control room looking at the satellite you summoned. Place your red crystal on the pink circle to the left of the button and then press the button to see the gun get destroyed (I'm unsure if this is necessary to beat the game, but its quick so why not do it?). Head back to the color coded door, go straight through it, and then go into the top door above your ladder and go straight twice more. You should now be in the room that you saw after your first cutscene; however, this time the fist of the robot is pierced through the floor. On the window to the right of the robot are some symbols which correspond to the symbols on the tablet. You can choose a symbol at a time and then exit the tablet to check the next one and your choices will be saved, and I don't want to have to describe which symbols are right. Plug in the symbols and watch another cutscene. Now a type of pod has come down by the color coded door. Head back and enter the door to finish the game and watch your final cutscene! YAYYY ALL DONE. Not too bad and fairly linear. I liked this one a lot, and if you follow this walkthrough you should get 100% completion no problem. P.S. I haven't played yet, but is this supposed to be like a sequel to "Escape from Island" which puts you in this sort of spaceship? WOOT . . . i've never been the first poster before. I must say I love this guys work. I'm kinda stuck . . .
after i cut the hole in the glass in the robot factory. I also cut the beams in the ceiling of the main room of that area . . . now what? and I found some pink plates, but i have no clue what to do with them . . .
Oh well, I usually get stuck, but I'm sure i'll get it after poking around a bit. Noooooo!! There're no walkthroughs yet :(. whatever is used to cut the hole. Where did you find that, magic? There's a certain place you can use the ladder. Ah. Found what I was looking for. Now onward! Cool stuff, and I like the optional little tie in with the last game. I also just finished with 90%. But how did you not use that item, Jonathan? It seemed necessary, as far as I could tell. hmm i think im missing one more plate... or 2... and the slot in between the cable and the crystal is empty. what am i missing?? did someone got to the part..
where there's a huge statue? i've used both gold and green crystal there, and then there was a video. i already exploded the asteroid too.. it seems like i'm missing two items. How did cut the glass and the beams? I still have : one flash light, a white jacket, a yellow rock, a pink rock, a pink helmet and a pink plate with lots of signs on it. And the cat is gone with someone. if you pick up the kitty, I think you get a perfect. I have three empty slots and two of the items I do have I never used. Does anyone know what the uses of the gold flake and robot arm are? Also, what items am I missing (I know one of them is the ruby crystal posted above)? I have a slot to the right of the sword; one left of the gold flake; and one right of the robot arm. The elevator to come down, but I can't seem to get in, and I only have the sword and shovel left, plus 6 empty slots. Any Help? Ok, I figured out the robot arm, any help on the rest? in the big pile before the robot. Here's what I've got so far . . . Grab the crane to go up. Put the handle in the slot, spin the handle and the door opens. Go forward. Click the rectangular object on the left wall, get the octopus plate. go forward. The lights on the wall to either side of the door are the codes for the other doors in this room (one to the left and one to the right) make note of the codes, turn left or right and enter the corresponding code to open each door. Facing Left: Click on the cabinet on the right, get the thing that looks like a flashlight. Examine it and click it to turn it on. Its a LIGHTSABER! Go right twice. Right door: Enter the code and go forward. Get the lab coat by the cat (then pet the cat cus' it's fun!). Open the cryo-chambers untill you find the pink card. Go forward. Use the laser sword on the pipes above you. Click the small red button by the door on the right. Go right. Use the laser sword on the big window. Pause the assembly by pushing the blue button on the computer screen (wait until the crane is lowering the part onto the robot below, then pause it.) Grab the robot arm. go left, back, back. Click the thing on the right with the sun on it. Grab the whats-it. Click the panel on the bottom right to get the key. go left. Click the ladder to go up. Go through the right door: put the robot arm in the thing on the left. turn the knob to flood the right side of the screen. Puncture the tank in the back with the light sword. go back and left. Go through the left door: put the round handle thing into the hole on the left. Click the panel on the upper right wall. get the chord. More to come . . . WHEW! Where is the cable? The one that is supposed to be between the robot's arm and the spacesuit? The only other things I am missing are whatever is to the left of the gold flake (NOT used yet...) and the 5th plate. Any help? you're missing a key, an emerald thingy and the red crystal must be to the right of the robot arm which i'm missing. for the key... did you find ALL the cupboards? try one of the rooms with the cupboard that slides out and has one on the wall. for the emerald and red crystal... they involve water. what do you have that can cut things? In the room with the big sphere machine (where you connected the chord and found the octlien plate). Put the octopus plate in the square opening on the right. go back and right to the hallway. Go back three times to the walkway. One of the plates goes in the square opening on the wall next to the door. go forward. Another of the plates goes in the square opening on the wall on the left. go back twice(to the room with the door that has the codes on either side of it) and then go left. enter the code for the door and go forward. Plug the chord into the machine on the left. go forward. examine the coat (in your inventory) to find a controller. Click the buttons on the controller to guide the satellite. Put the red crystal on the red circle. Push the red button to blow up the laser! Thats as far as I've managed to get. Any one know what to do next? 25. was unnecessary to beat the game. i couldnt figure out how to get rid of the forcefield the first time around. and then i got 90% for that one. Great walkthrough! I'm 100% out! Thanks!! I like P&Cs with continuing storylines. This comes in a close second to the Submachine series in my book. Having a little trouble with the walkthrough. "...and then use your key on the door. Go on through." What key exactly is this? In my inventory I have no key. As for the keycard, it's stuck in the slot with the big robot. Also no other mention of a key other than keycard is mentioned previously in the walkthrough. Great game! I didn't need a walkthrough, but was still challenged by the puzzles. Love to see more like this. I think im missing one thing - the last item slot is empty, and the robot wont power up - no glowing orb. digging the space suit out of the golden mountain. I musta tried twenty times before it worked. Hey, not bad. I used the walkthrough to finish, but it was a good way to pass some time. Go right on the room with the door with the light codes, and click on the smallish panel on the bottom right. Maybe I'm missing something, but I can't even get the game to start. All that comes up is a flash object with a link to the game page in it. Hi Corsicar, yeah, there is definitely something going on there. Something has changed with the developer's site since we posted this review. My guess is that the game has been so very popular that they have had to implement some restrictions. Unfortunately, it appears these restrictions are preventing anyone from playing at the moment. My best advice is to check out the game later, hopefully they will have it sorted then. Yeah, I noticed the Aztec games are pretty good (I played escape from island), but the shrine doesn't work on my computer! I just see a blank game screen with some links and stuff around it... but this works (it's still loading however)! ??? anyone have an idea why? I had to right-click on the game and select "Play" to get the game to start. Ooh, thank you Albie! It's working now! It had kept loading, before I saw your comment I closed it thinking it was huge. In any case that cat is soo freaky. He has superpowers (Shielding and batting arrows away with his tail) and turns on computer monitors with his tail... Huh? That's really wierd. Odd... When I click on the link, it gives me the page, but instead of the game I get a big green box with the page URL in it. Jay: No luck. This is what I get: http://urltea.com/1l34. Tried on both FF for Mac (2.0.0.7) and Safari (2.0.4). And oddly enough, this was working fine on my Mac at work earlier today. I've no clue what's happening on your computer, dotcomlarry. When I click the link I get the game page with a URL in the game window instead of the game. Right-clicking and choosing play makes the game play. Perhaps it's a caching issue? Update: no, it's not a caching issue, since I emptied my cache and retried and the game loaded as before with the URL in the game window. Right-clicking and selecting Play gets the game underway. I'm using Camino on a Mac. Tried it in Safari (2.0.4) with the same results. They must be doing some restriction based on IP, that's the only thing I can think of why it would work on some computers and not others. Hooray! I finally got through one of these without a walkthrough! That was very well made. Good on you, Aztec! I look forward to more. Most point and click games, if I need a ton of spoilers I just give up, because it's not fun to me to play the game while frustrated and/or while following someone's walkthrough. These games though... I find them so fun, so engaging, that I will follow along with the walkthrough and play it even when I don't know what to do on my own. I'm having problems with Step 20 of the walkthrough. It says to go through the bottom door where the ladder is - but everytime I try, it takes me up the ladder through the top door. How do I get around this? Nevermind my previous post.. I clicked a few more times and this time it let me. But I'm sure I didn't click anywhere I hadn't already tried! Go figure! Arletta, I know you said forget your last post but I feel like a lot of people may have issues with this. In step 13 I explain that once you have the ladder up you have to click carefully in order to go through the door you want. clicking anywhere on the screen will send you through the top door; however, clicking on the arrow on the top of the screen (the same one used to navigate throughout the rest of the game) will send you through the bottom door. hey i can't get out, what is the shovel for? Just wanted to say this is one of the best online graphical adventures I've played. Very well created. hahah! just discovered something, duno if anyone else has tried it.. I let this game stay open overnight and came back and finished it. My time was 13:07 and I got Perfect 100% This was a really cool game. I enjoyed it. where is the fourth tile?i don't want to look at the walkthrough because i'll probly look at the wrong spoiler.i got the the octopus tile and monkey tile and the other one that goes below the jacket in your inventory. or is there five tiles in all? by any chance is it pink? You probably didn't connect the cord to the blue orb. After you do that, you should be set! I have a tricky problem. I can't found the last box where I should put the Octplus Plate! I looked everywhere in each room, put my eyes are lying me somehow :) Is someone kind to indicate the place? Is it hidden? am I just an idiot or does line 15 of the walkthrough mention a key wich is nowhere to be found? or have I read the walkthrough many times and not found any other referance to it? thanks for the help! Im at the pod near the color coded door, but I can't enter. I can't blieve this... has anybody encountered a bug? I'm on the last part of the game and I can't go through the door below the ladder!! Anytime i click it it leads me to what would be the upper chamber. I can't return to where the pile of gold and then the robot were! According to the walkthrough I'm in what would be setp 20, but can't go on!! I'm pretty sure that your comment is for Covert Front 2, not Escape from Octlien. click the arrow to go through the bottom door and click the top door to go through there. cant use laser sword on glass or pipes. Is it b/c i alrdy grabbed the gold flake? I had the same problem to you. I think it is a bug. When you are summoning the satellite, you should wait for a few seconds. If you don't, the controller will be disappear as well as the satellite don't show up. I've been pressing the buttons for a while now and nothing's happening. What to do? Funny thing, just looking onto what things people get stuck om saves me from running to walk-through untimely.. I appreciate the simple graphics in these games. can some1 plz post a walkthrough? I click the escape pod door, but couldn't get in. Only the space suit is left. What's wrong? the robot's fist coming through the floor. I think the game's a bit buggy! Make sure to save the poor little cute kitty! It is part of what gives you 100% completion. Just click on him to pick him up after blasting the giant robot off. Anyway, I love this game series! Walkthrough left off a step; you need to go back to the room with the big robot and hit the 3 pink buttons above the slot where you entered the keycard to make it blast off. when i click on the rock in the first garbage room it just sends me to the same game on a new site, well annoying what am i doing wrong? I can't put the plate in the brown box. I drag it there, and it just won't go. I don't see a plate in the panel in the right room. I keep dragging the key to the door and NOTHING HAPPENS. I'm really frustrated. No one else here seemed to have that problem, and I played the first 2 episodes without trouble. Is it me or is this game a thinly veiled metaphor for what Hernán Cortés did to the Aztecs?